House via Structures Building Co.
My camera battery isn’t charging for some reason and my tri-pod appears to have bit the dust so I can’t show you what I’ve been working on in the real world, all I can do today is DREAM! Nothing wrong with that though! You know I love a pretty house tour so I was happy to stumble upon this lovely gem. 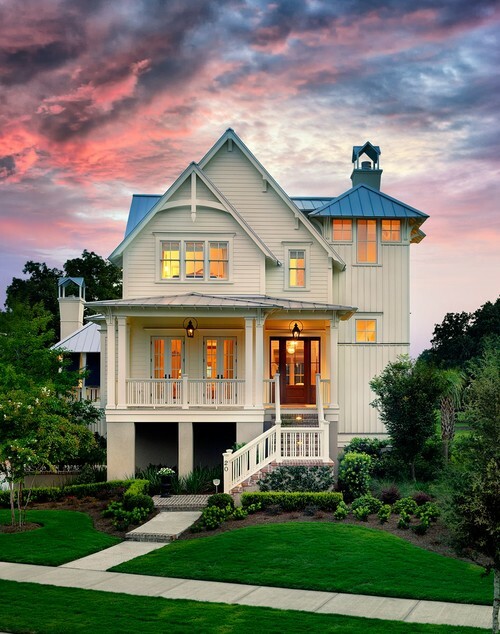 I’d say if I lived here … I would be constantly walking around admiring all the woodwork! GORGEOUS! And I’d invite you all over for a big party, of course. 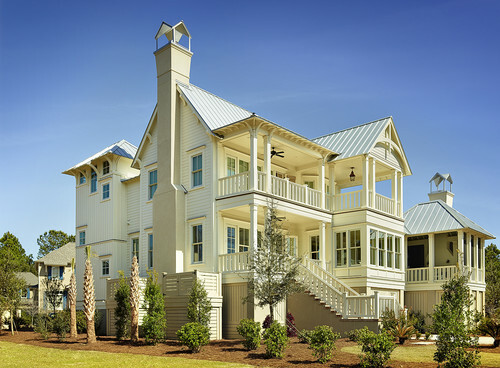 See Structures Building Co. for more loveliness! How about you? What if YOU lived here? Remember, this is just for fun — so dream a little! Gorgeous….I would never leave! Would love to know what colour is on the fireplace wall? Wow! If that was my house, I’d never have to go on vacation! That is gorgeous! 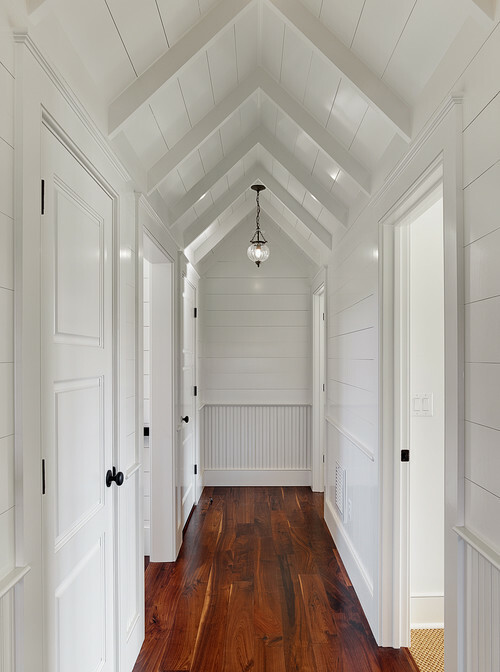 That porch with the fireplace, that hallway……love it all! So. If I lived here — as beautiful as the interiors are — I’d spend 90% of my life outside on the porch of my choosing. I would also anticipate a knock on the door from Southern Living magazine, asking me to photograph my beautiful home. This house looks a lot like something they’d feature, doesn’t it? There’s nothing like a South Carolina house. I vacation there every year and it is so hard to pull myself away at the end of the week. They are so inviting and fresh. All but sleeping hours are spent on the porch (with the exception of naps) and this porch is awesome! If I lived there, I would take a deep sigh everyday and just walk arund in wonderment and awe! 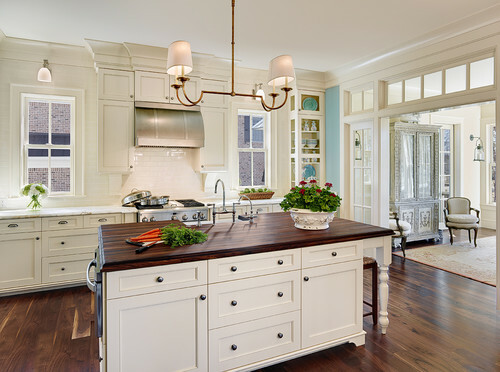 That could very well be my new “happy place”…it gives true inspiration, especially for my kitchen that needs to be redone…as does yours, just lovely. This is phenomenal!! Thanks for sharing…..if I lived here I would definitely be having coffee on that covered porch EVERY morning. You’ve given me so many rooms to Pin. I just read somewhere that Pinterest is shopping for the broke. (which I love!) Your dream homes are much the same: home shopping without having to go to Open Houses! Oh, heaven! I wouldn’t even change the beautiful blue wall color, even though I’m not really a blue gal, at least not for a long time, maybe never. Could a bunch of us move in together – I’m sure there’s room – maybe even rent the place for a week? My extra serendipity and inspiration is that picture of the kitchen into what must be the dining room and the lovely use of the area rug over the beautiful wood floors. 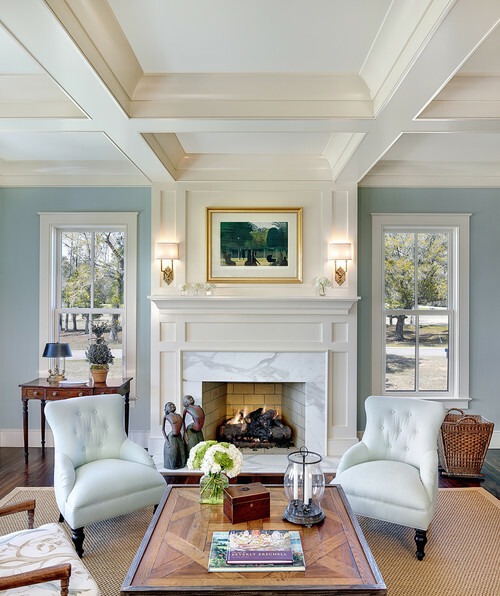 Checked the builder’s website and area rugs are used perfectly in every room. Inspiration to me because, even though I won’t get hardwood floors in my home in dry and dusty Arizona + 3 cats + heavy office furniture, etc., I want the tile floors throughout my open floorplan to have the same continuity of the floors in this house without looking like a museum. 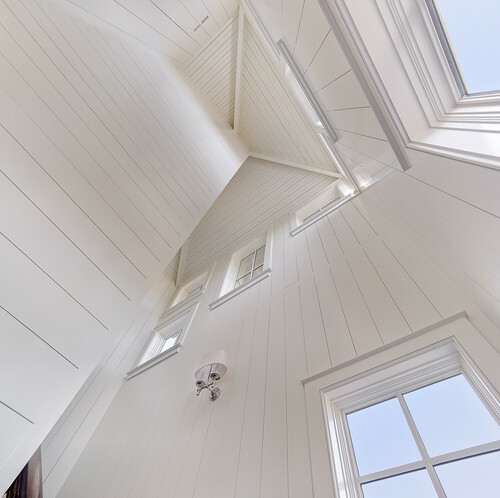 I’m finding it hard to bring up pics from HOUZZ that shows this as well done as the homes by this builder (and I certainly haven’t found inspiration here in Arizona, even with custom builders). Thanks for the visual pleasure. Melissa, and for triggering the brain’s dream function (if only) as well as its thought/idea function (I could do something like….). Fun and productive post at the same time. Melissa, I love your posts and updates;they are truely inspiring! Your blog is a highlight in my day. Thank you ! This home is beautiful, beautiful and fab-u-lous…on the inside. However the outside of the home is not my preference as it appears to be standing on stilts. But … that is the reason every home is different and each person can choose their own. Errr…no. I’m sorry but I have no desire to live in a big house like this but the rest of you should knock yourselves out! I guess I prefer my space to be outside of the house. As in lots of land to roam and enjoy by horseback or old creaky pick up truck. If I were to entertain a dream it would be to add a basement under my house, a cover for my hot south side patio and some new windows. Simple gal here…simple life! I think that if I lived here … I would only leave the porch for food and an occasional shower. Give me a nice chair and a place on this porch to read and relax. It is a beautiful spot as well as the insider. I would say the house is for a big family. Since I have retired, I have no desire to clean such a large place. We are in a 1200 + square foot home with my hubby (also retired), along with two inside cats. It is just what right for two adults and all the clutter. Oh, my. How much PhotoShop effort do you think went into that green lawn?! And is it okay that I’m sort of coveting that probably-been-color-enhanced-green-grass, while we have a foot of snow on our yard? However green their grass is, I still like YOUR kitchen better than their kitchen. And I still think your hardwood floors are cleaner. Have a happy Monday! OOO…I love the “imagine” posts! If I lived in this house, I would have my darling book club ladies over and we’d meet on the porch where I would offer them iced coffee or tea, homemade scones (in real life I am the world’s worst cook!) and a fabulous fruit compote in a cute little dish with a bird perched on the side. After book club, I would don a casual outfit (from my wardrobe, which is entirely Eileen Fisher (In real life, out of my price range!) and my gentleman caller would arrive (I actually have one) with a beautiful gardenia in a lovely blue toile pot. We would light candles, pour a wonderful, expensive (real life…Two Buck Chuck) glass of wine and cook together Fried zucchini for an appetizer, Lobster with a wonderful crunchy salad and a dessert of chocolate fondue with oranges, strawberries, lady fingers etc. Luckily I own a fabulous fondue pot ready for any occasion (not) The evening would end on the upper porch, cuddled under a light blanket, playing footsie! Notice it’s summer…Ha…I am off to have a lovely real day now!! Thanks for the fun. 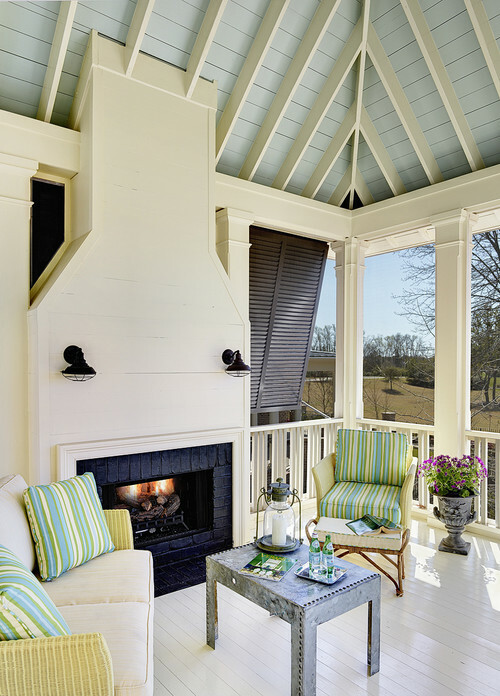 I just love the porch with the outdoor fireplace. Where I live the summer evenings can be quite cool so this would be amazing. I’d put a big Christmas tree up inside by the French doors on the left so you could see it from the outside. Hi..love your blog. so much to enjoy! I had a question – I pinned some things from your blog, and a key showed up in the post on some of them. The post included your website, and when I clicked on the picture it went right to to the article. But I didn’t know if that meant I wasn’t supposed to pin that particular item. I deleted them all just in case…. I have a question. I pinned some things and a key appeared on the post. Does that mean I’m not supposed to pin them? It included your website and went right to the article. idk maybe it’s something positive? Wow, unbelievable for the family. I wish I have a house like this. It’s truly beautiful place.